The holiday season is approaching (quickly!) and if you are anything like me, you are not prepared. Oops! 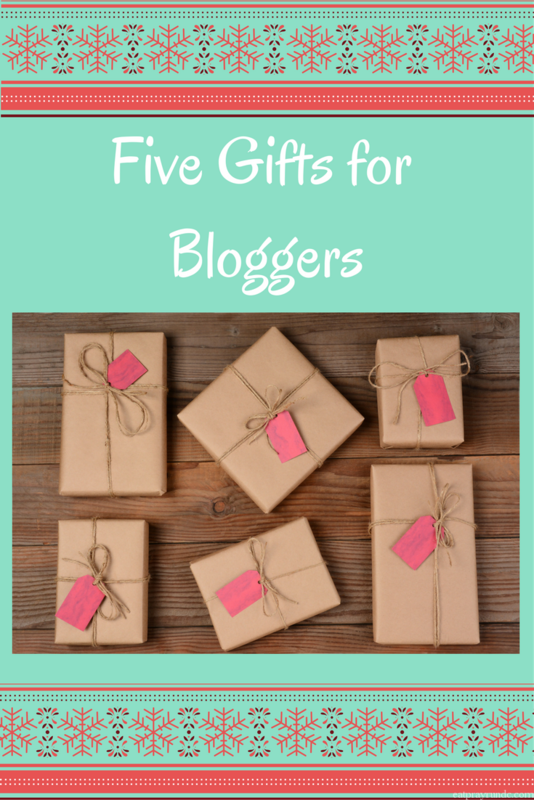 Today I’m sharing five gift ideas for the blogger in your life. You can find some gift ideas for your runner friends here. (note: this post contains affiliate links). Pay for your blogger’s hosting fees. Hosting a blog ain’t cheap. A great gift would be to pick up your blogger’s hosting fees for the next year. Or if your blogger is looking to move to a self hosted blog (you can sound all fancy when you ask them if they self host), I recommend either Bluehost or Siteground. Bluehost is where I started and until my traffic grew, it was perfect. Intuitive and easy to use. Once I was regularly getting over 10k site views a month, I switched over to Siteground and have been extremely happy. I’d recommend either of these hosting companies depending on your needs. Coschedule. I’ve written about Coschedule here and here, but in short it’s a great way for your blogger to stay organized with blogging. They will love it- trust me! A subscription to Tailwind. Tailwind is my favorite Pinterest management tool. I wrote about it here – it’s really excellent and I’ve been encouraging my blogger friends to check it out. Tech equipment. Does your blogger friend need a lens for her iphone to improve her photo game on her food blog? Check this one out. Or maybe a wireless mouse for their home office? Or even a tripod for their phone? You can get creative! A good book. Yes, a book. Ruth Soukup’s How To Blog For Profit: Without Selling Your Soul is absolutely fantastic. I bought the book and then took her course (which I recommend!) and I found it incredibly helpful! What’s on your list if you are a blogger? LOVE my EC planner! Don’t knw what I’d do without it. i have so many friends that LOVE theirs i knew i had to include it! I’ve been looking for a planner. Is it called the life planner? Or is there a specific one for bloggers? I have heard how glorious this EC planner is but to tell you the truth I have a planner that was less than $10 and I love it! I LOVE my Erin Condren planner, just wish they weren’t so expensive! yeah i hear you – a good gift idea though! I couldn’t agree with you more about my EC calender. It is freaking amazing for OCD people like myself. Lol I look forward to my new planner every year. Best investment I did to keep my life organized. yes, i have many friends who LOVE it! Great gifts. I would love a pc. Mine has some virus that I am unable to do anything. Maybe there will be a good sale after Christmas. me too, friend, me too! great list! I’m a weird mix of paper and computer. I use Outlook to plan everything!! Ok, I’m sold on that planner. Thanks for the ideas! Oooh I want to read that book! great idea! I loved Ruth Soukup’s book ” How To Blog For Profit: Without Selling Your Soul”! She is a great writer with a ton of great actionable ideas for blogging. Oh ya and as an added bonus the book includes a link to her totally cute printable blog planer! LOL – you are hilarious! Great list! I really need to get a tripod for my phone. I still need to figure out Pinterest! I know I keep saying that. I signed up for Tailwind but I am just clueless. That will be one of my goals for 2017. Along with meeting you and running with you! Tailwind is great – once you figure out some basics! And YES! We have to meet in 2017!